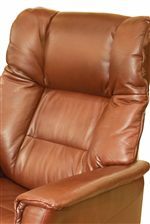 The Verona recliner relaxer is a seriously comfortable and functional seating option. Its glider base gives you a lock/unlock option to best suit your preference. This recliner glides and rocks so you can achieve maximum relaxation. 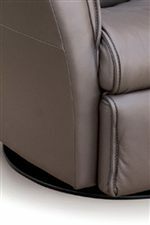 The recliner's pillow arms keep you extra cozy, while a 360-degree swivel make this piece dynamic and enjoyable. 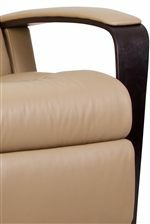 A front skirt keeps this chair looking clean and neat as it hides construction pieces when the recliner is utilized. 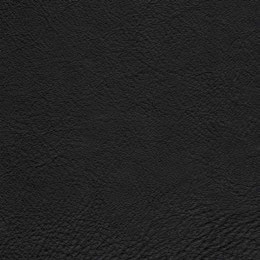 This upholstered recliner is available in a variety of fabric and leather options, and in a large and standard size. 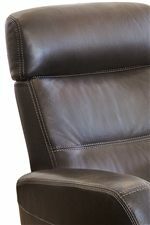 The Recliners Modern Verona Recliner Relaxer with Swivel Base by IMG Norway at Wilson's Furniture in the Bellingham, Ferndale, Lynden, and Birch Bay/Blaine, Washington area. Product availability may vary. Contact us for the most current availability on this product.